Oman's oil and gas reserves are comparatively low relative to those of other Gulf Co-operation Council member countries. This article explores the potential of using geothermal energy resources for electricity generation in Oman. The temperature of 53 boreholes in Oman is more than 100°C, meaning they can be used in binary geothermal plants for electricity generation. The maximum temperature (173·68°C) is at Petroleum Development Oman well ‘Makarem-I’ located in the northern part of Oman. There is opportunity for Oman to adopt renewable energy resources and explore the potential of geothermal in more detail. This will help the country to reduce its dependency on oil and gas and compete in the region towards adopting renewable energy. Geothermal energy resources in Oman, by Tariq Umar, MSc, CEng, MICE. https://doi.org/10.1680/jener.17.00001, Proceedings of the Institution of Civil Engineers - Energy. ISSN 1751-4223 | E-ISSN 1751-4231. Volume 171 Issue 1, February, 2018, pp. 37-43 - Themed issue on urban transitions to fossil-fuel-free futures. Einar Karl Friðriksson einkaleyfisráðgjafi segir að til að hámarka þau verðmæti sem felast í hugviti og nýsköpun ættu fyrirtæki sem standa framarlega í orkuvinnslu að íhuga vel möguleika á að vernda sín hugverk. 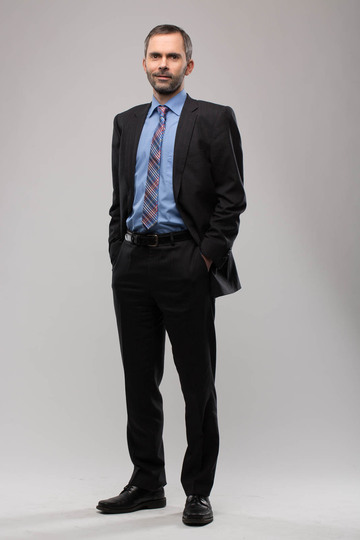 (From Google Translation) Einar Karl Friðriksson, patent consultant says that, in order to maximize the value of innovation and innovation, companies that are highly committed to energy processing should consider the potential to protect their intellectual property. 2017 GRC Geothermal Photo Contest. According to an analysis by the Sun Day Campaign of data in the latest issue of the US Energy Information Administration's (EIA) "Electric Power Monthly" (with statistics through December 31, 2017), electricity generated by renewable energy sources (i.e., biomass, geothermal, hydropower, solar, wind) was 13.2% higher in 2017 than in 2016. Moreover, the production by each renewable energy source - as well as its share of the total energy mix -increased: solar (utility-scale + small-scale) was up by 40.5%, hydropower by 12.0%, wind by 12.0%, biomass by 2.1%, and geothermal by 0.9%. Combined, renewables accounted for 17.6% of total electrical generation in 2017, compared to 15.3% in 2016. 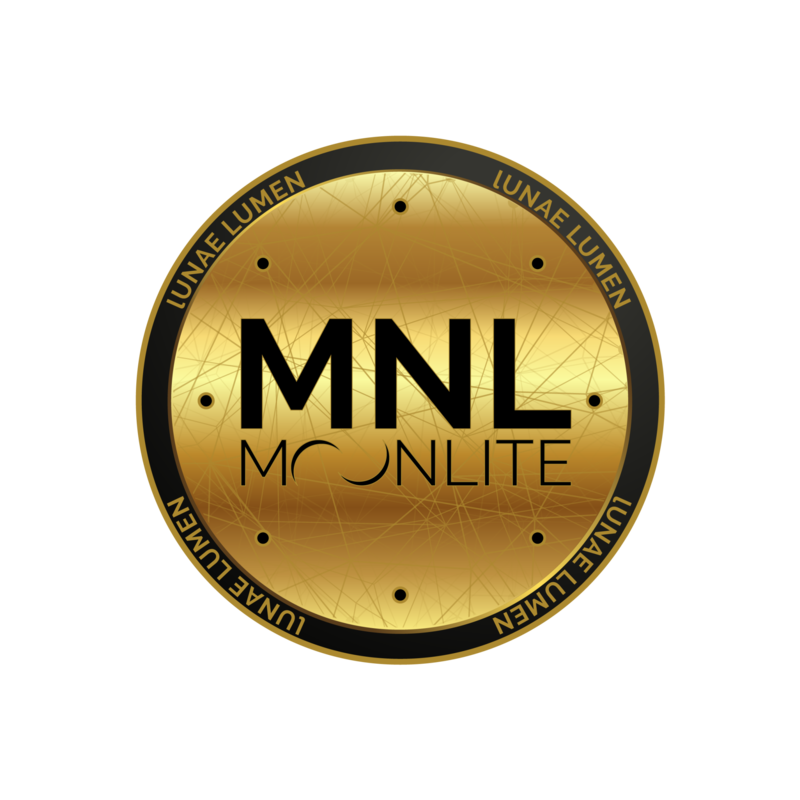 Launching today with an Initial Coin Offering (ICO), the MoonLite Project is a facility to mine cryptocurrencies at an industrial level. The twist is that it aims to do so without inflicting any environmental damage on the planet: the facility will be powered by 100% renewable energy. It can do this because of its location. Land will be broken in Iceland on 2 April this year, and the plan is for the operation to be powered exclusively by geothermal, hydro and wind sources, with the first coin mined in August. Coming in at roughly 4.4 cents per KWh, the green energy available in Iceland is competitive with Qatar – the cheapest they could find in the world. A new study shows that it is possible to transition the entire world to 100 per cent renewable energy, with a dependable power network, at a reasonable cost and using already established technology. One of the enduring problems in the renewable energy sector is how to make power harnessed from wind, water and sunlight more reliable. Creating a stable clean power grid is an important obstacle to overcome if the world is to move away from fossil fuel consumption. A group of engineers at Stanford University, the University of California, Berkeley, and Aalborg University in Denmark have proposed a solution. They envision a sustainable energy network made up of a mix of weather-based power sources and other more predictable clean sources such as geothermal plants and reservoirs, tidal and wave devices and hydroelectric plants. The stability of the latter, combined with existing power storage technology, would offset the shortfalls and capture the surplus of the former. Renewable Energy, Volume 123, August 2018, Pages 236-248. Rabobank, a Dutch multinational banking and financial services company, gives top priority to sustainable companies with transparent, future-proof business models. As far as Rabobank is concerned, this includes geothermal energy. The 2015 natural gas saving, thanks to the use of geothermal sources (Doublets) amounted to about 77 million m3 of natural gas. The dependency of (greenhouse) horticulture on fossil fuels can, so, be reduced. This is even more important when taken in the context of recent discussions about reducing the use of Groningen's natural gas. This is why Rabobank is involved, as a financer or source of knowledge, in almost every project pertaining to the use of geothermal energy in Dutch greenhouse horticulture. Besides the 14 doublets that are already operational, there are eight more in the preparation phase. Recently, Rabobank decided to make EUR20 million of risk capital, in the form of subordinated loans, available for projects aimed at reducing CO2 emissions and the dependence on fossil fuels. This was needed because although the government supports these goals, it is their increased regulations that are causing delays in various geothermal projects. The latest issue of Geothermics’ Volume 73 (May 2018) has closed. 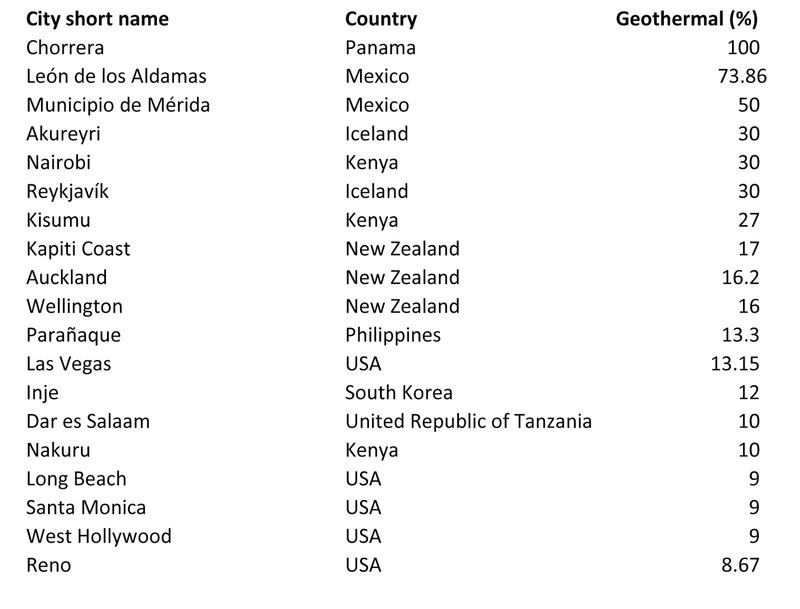 Through affiliation with the International Geothermal Association (IGA) the GRC offers a discount to the professional journal Geothermics, which publishes articles on the theory, exploration techniques and all aspects of utilizing geothermal resources. Members can contact the publisher Elsevier at JournalsCustomerServiceEMEA@elsevier.com in order to subscribe to the journal. Upon request Elsevier will send a proforma invoice to the member e-mail ID. Members can make their payment via bank transfer, fax their card details or call Elsevier with the information provided in their invoice. The discounted price details for IGA/GRC members is $285. Fuel needs to be shipped in. Isolation results in fragile electricity grids. Just under 7,000 photos are available for re-use in the GRC Flicker photo collection. Images at various sizes can be re-used for various purposes - just reference the Geothermal Resources Council (GRC) when you do. GEOPLAT is proud to announce the launching of the Geo-Energy Europe project. Funded under the “Clusters Go International” call, which is part of the European Competitiveness of Enterprises and Small and Medium-sized Enterprises (COSME) programme, the project will consist in creating a transnational cluster specifically aimed at increasing the performance & competitiveness of European SMEs in all industries concerned by the use of subsurface for energy, or "geo-energy", on transnational (EU) and world markets. Geo-Energy Europe officially started on Jan 1, 2018 for a 2 yrs duration. It involves 8 partners from 7 countries: Pole Avenia(coordinator) & Geodeep / France, EGEC / Belgium, GEOPLAT / Spain, Geoenergy Celle / Germany, CAPES / Hungary, Jesder / Turquey and Geoscience Ireland. What if we could produce a surface heat flow map over an entire geothermal prospect for less than the cost of a single heat flow well? After 10 years of R&D, Hot Dry Rocks PL has demonstrated a tool that can do just that. We call it the Heat Needle. The system works like this. We drill a one meter long rod into the ground with an off-the-shelf electric drill, and insert a set of highly sensitive and accurate thermal sensors. These sensors passively record the temperature in the top meter of the ground several times each hour for several months. When processed in the frequency domain, these records of ground temperature tell us the thermal diffusivity of the ground to a precision of ~±1%. We also correlate our site-specific records of surface temperature against more diffuse but long-term satellite-derived records of surface temperature. That lets us extend our own surface temperature record many years into the past. 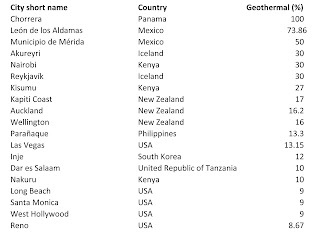 The top 20 cities that source geothermal energy are topped by the city of Chorrea in Panama. Of the 570 plus global cities reporting to CDP, over 100 now get at least 70% of their electricity from renewable sources such as hydro, geothermal, solar and wind. We expect to see even more cities targeting a clean energy future. Cities not only want to transition to renewable energy but, most importantly - as our data shows - they can. By reporting to CDP cities can better understand their impact, share knowledge and best practice, and use the information gathered to set ambitious renewable energy targets. Communities living in areas bordering energy firms that use geothermal steam to produce electricity could start earning from the resource if a new bill sails through. The Energy Bill 2017 proposes setting up of a royalty fund where companies such as KenGen and OrPower 4 Inc will in the initial years pay up to 2.5 per cent of their geothermal revenues, which will be shared by the communities and Government. The bill, however, dampens what would have been a party for communities in geothermal steam rich regions by giving immense powers to the Cabinet Secretary to do away with the royalties at will without consultations. off-campus field testing to 300 m PPGD depths. During each of these experimental phases, collected test data will validate numerical models. The third year is reserved for numerical modeling, based on the results obtained during the first two years, to provide SGP with prognoses regarding the feasibility of developing PPGD for drill depths much larger than 300m. State-owned energy giant Pertamina aims to gradually increase its investment spending for renewable energy to around 15 percent of its total capital expenditure by 2030 from a mere 1 percent at present. Pertamina set a 2030 target to generate 2,300 MW from geothermal power plants. 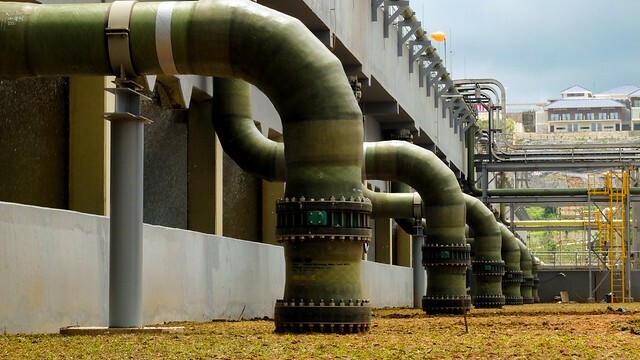 Pertamina currently operates geothermal power plants with a combined capacity of only 587 MW, a mere 2 percent of the country's total geothermal potential. Considered as the world’s seventh largest producer of oil, the UAE has been focusing on a research on potential uses of geothermal energy — the heat produced inside the earth — as a new source of clean and renewable energy. The project is being undertaken by the UAE University (UAEU) whose researchers are studying the geological sites in Al Ain and Ras Al Khaimah. Researchers found out that the water temperature reaches to as hot as 120 degrees (celsius) beneath the surface of about 3 kilometers deep. According to Dr Hakim Saibi, associate professor of geophysics at UAEU, and one of the researchers, the findings did point to the possibility of tapping geothermal energy in the UAE. “The potential for using geothermal energy is good. Based on our findings and the data gathered at the sites, we can produce around 1,000 megawatts of electricity using the geothermal energies from these areas,” he said. Japanese firms have emerged as top builders of Kenya’s geothermal power plants and suppliers of heavy duty equipment such as steam turbines, tapping into the country’s shift to green energy. The bulk of Kenya’s geothermal plants have been constructed by companies from the Far East nation, including global conglomerates Mitsubishi, Toyota Tsusho and Toshiba. Power producer KenGen recently contracted a consortium comprising Mitsubishi to construct a 158 MW Olkaria V steam power plant in Naivasha. It will be completed mid-next year. The firm will also supply turbines that convert steam to mechanical energy and passed through generators to produce electricity. Townend et al. 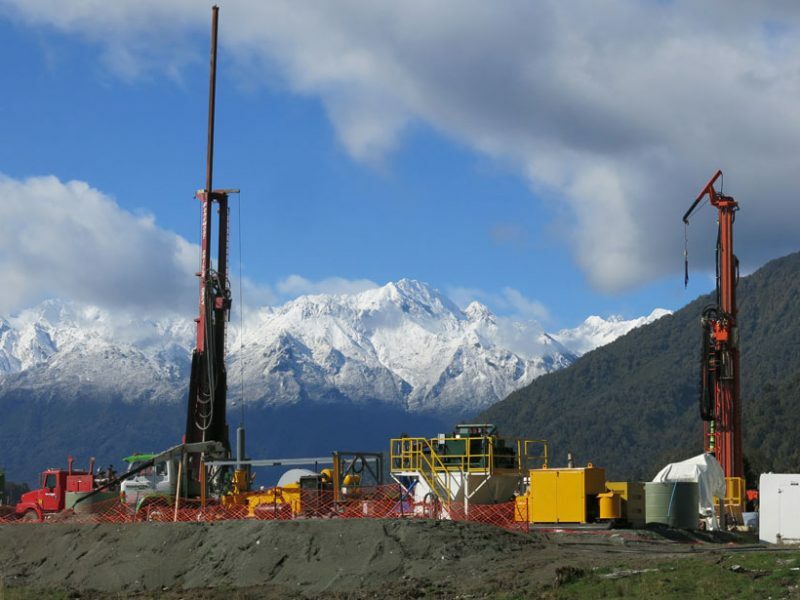 recently published measurements made in the Deep Fault Drilling Project DFDP-2B borehole and studied the hydraulic properties of the Alpine fault and the damage zone surrounding it. Using downhole logging equipment and surface measurements, the scientists measured temperature, pressure, and a broad range of other geophysical parameters along the length of the borehole. The science team discovered that the rocks surrounding the Alpine Fault are much hotter than anticipated and are extensively fractured. Mud level data revealed that the hanging wall portion of the fault—the upthrown (Pacific) side of the fault—contains an active hydraulic system in some areas. Scientists observed that mud levels equilibrated rapidly during the drilling, showing that some fractures in the rock surrounding the fault can transmit large volumes of water in a matter of hours. Kengen’s half year profit has dropped from Sh4.6 billion in 2016 to Sh4 billion in the six months ending December 31st, 2017. The power generator at the same time saw an increase in revenue from Sh17.7 billion to Sh18.6 billion, an increase of 4.93 percent. “This was due to higher energy revenues from geothermal and increased steam revenue following the completion of the Olkaria-Suswa transmission line,” says Kengen Chief Executive Rebecca Miano. Looking forward, KenGen says it’s on course to complete the ongoing construction of the 158 MW Olkaria V power plant by 2019. Strada Energy, the Jersey (a self-governing dependency of the United Kingdom) based geothermal project development company has today entered into a services agreement with Mannvit from Iceland to provide engineering and other technical services for Strada’s deep well geothermal district heating and electricity generation projects. Strada Energy utilises the patented drilling technology from Strada Drilling who are able to drill deep wells in hard rock up to 75% cheaper and faster then utilising conventional drilling technology. This technology opens up the opportunity to develop geothermal energy district heating and electricity generation applications across Scandinavia and Northern Europe. El presidente ejecutivo de la Empresa Nicaragüense de Electricidad (ENEL), Ernesto Martínez Tiffer, indicó este miércoles que en las próximas semanas tienen previsto iniciar los estudios de factibilidad de tres proyectos de generación de energía con fuentes geotérmicas ubicados en el volcán Cosigüina, Casita-San Cristóbal y volcán Mombacho. El funcionario explicó que la expectativa es que en cada uno de esos puntos se establezca una planta con una capacidad de generación de 35 megavatios. El objetivo es que dentro de seis años se puedan agregar al sistema de interconectado nacional un total de 105 megavatios producidos en esas tres nuevas generadoras geotérmicas. 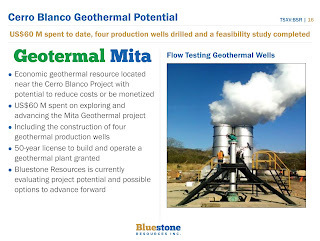 (From Google translation) The executive president of the Nicaraguan Electricity Company (ENEL), Ernesto Martínez Tiffer, said Wednesday that in the next few weeks they are planning to start feasibility studies for three geothermal power projects located in the Cosigüina volcano, Casita- San Cristóbal and Mombacho volcano regions. The official explained that the expectation is that each of these locations will host a plant with a generating capacity of 35 megawatts. The goal is that within six years a total of 105 megawatts produced in these three new geothermal power plants can be added to the national grid. A symposium on applications and enhancements to the TOUGH ("Transport Of Unsaturated Groundwater and Heat") codes for multiphase fluid, heat, and chemical transport will be held at the Lawrence Berkeley National Laboratory (LBNL), October 8–10, 2018. The TOUGH Symposium 2018 will consist of oral and poster presentations. Depending on demand/interest, “short courses” on select TOUGH codes will be offered immediately preceding and/or following the symposium. The purpose of the symposium is to bring together users of the TOUGH family of codes (which includes TOUGH2 (and TOUGH3), iTOUGH2, TMVOC, TOUGHREACT,TOUGH-FLAC, TOUGH+, TOUGH2-MP, and many others) for an open exchange on applications and recent code enhancements. Abstract submission is open and will close on Wednesday, April 18, 2018. Kenya has pushed hard to harness its geothermal capabilities. It generated 45 megawatts of power with geothermal energy in 1985 and now generates about 630 megawatts; nearly 400 megawatts of that production has come online since 2014. “No matter how you cut it, that is a significant amount of generation in the geothermal world,” said Gene Suemnicht, chief executive of EGS (also a GRC Board member), a California-based geothermal consultancy that has worked in Kenya. From a geological perspective, Kenya’s geothermal conditions are ideal. Geothermal capacity has been deployed since the 1970s; over 2.5 GW was installed in 2000, increasing to 3.4 GW in 2016. The Philippines, the world’s second-largest producer of geothermal electricity after the United States, leads the region with nearly 2 GW deployed in 2016. 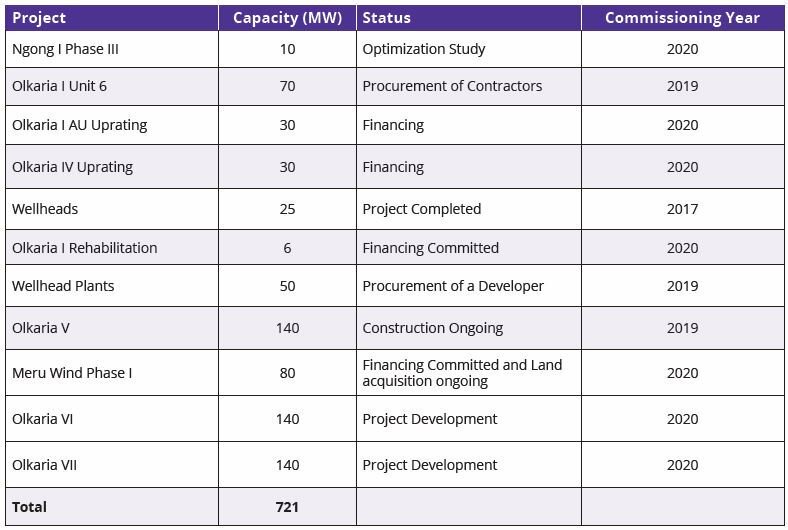 Capacity in the Philippines remained largely stable between 2000 and 2016, with much of the regional growth coming from Indonesia, where capacity rose from 525 MW to 1,534 MW in the same time frame. Recently, Malaysia has also forayed into geothermal energy: its first plant is scheduled to be operational by May 2019. Overall, geothermal is the only technology that has seen a slight increase in weighted average investment costs, from USD 2,937/kW in 2014 to USD 3,185/kW in 2016. Geothermal costs are highly dependent on the quality and quantity of the resource (and associated economies of scale) and the technological options chosen to develop a site. The observed increase in investment costs of 8% is most likely because of the quality of sites being developed in 2014 and 2016. Weighted average geothermal capacity factors declined slightly from 86% in 2014 to 84% in 2016, most likely in line with the development of more challenging projects in the region. Nice video including a look at South America’s First Geothermal Power Plant at Cerro Pabellón. The UK Geoenergy Observatories project was formerly known as the Energy Security and Innovation Observing System for the Subsurface (ESIOS). The UK Geoenergy Observatories project will establish new centres for world-leading research into the subsurface environment. The knowledge they generate will contribute to the responsible development of new energy technologies both in the UK and internationally. The BGS has worked with the wider geoscience community to identify two preferred geological locations. The first research field site will be in the Thornton area (Cheshire) and will focus on shale gas and carbon capture and storage (CCS). The second research field site will be in Glasgow, Scotland and will focus on geothermal energy. According to a blog by the Geological Society of London, Geothermal energy may be a sustainable and scalable heat source. But we need to understand more about heat transfer, subsurface chemistry, biology and water movement to find out whether we can scale up geothermal energy safely and sustainably. Per the agreement, first reported in August 2017, Varmaorka will buy 100 modules from Climeon, an order with a total value of more than EUR 30 Million. The first phase of the order consists of seven modules, and delivery will start in the second quarter 2018. The modules will be distributed across 10 to 15 individual sites and installed over a period of 30 months. The total installation, providing 15 MW of electricity, is enough to power 25,000 Icelandic households. Project leader GNS Science has secured enough funding to make a start on the six-month project that aims to identify the areas of greatest potential for development of geothermal heat for direct use such as in horticulture, hot pools, accommodation facilities, and industrial applications. The possibility of small scale electricity generation will also be considered. The main output of the project will be a report that describes and ranks prospects for geothermal heat supply development. Its aim is to identify up to four prospects for detailed investigation in subsequent stages. The study area will range from Fox Glacier to Murchison and extend to places such as Lake Brunner. In contrast to traditional methods, seismic amplitude ratio analysis (SARA) requires only the background amplitude of seismic waves to locate where an earthquake originates. Although previous studies have shown that the method can complement the traditional approach and reveal the path of traveling magma, it has never been directly compared with such a high-resolution set of traditional sensors. Using just 15 stations, the team was able to track the magma’s trajectory with remarkable accuracy, they report. The SARA technique also revealed new dynamics in the magma’s flow. The technique could help scientists track volcanic activity in settings where there aren’t many monitoring stations, the team says. Geothermal Heat Pump Tax Credits Reinstated! Hoogweg Paprikakwekerijen (Hoogweg Sweet Pepper Growers) in Luttelgeest is woensdagmiddag begonnen met boren naar warm water in diepe grondlagen. Het water wordt gebruikt om kassen te verwarmen. Op die manier kan het bedrijf flink besparen op het gebruik van aardgas. In totaal worden drie putten geboord van 2 kilometer diep. Eén van de putten wordt gebruikt om het water van zo'n 70 graden omhoog te pompen. Dat water verwarmt de kassen. Als het afgekoeld is naar zo'n 20 graden, gaat het water via de twee andere putten terug naar de bodem in om weer opgewarmd te worden. Hoogweg investeert twintig miljoen euro in het project. (From Google Translate) Hoogweg Paprikakwekerijen has started drilling for hot water in deep layers in Luttelgeest on Wednesday afternoon. The water is to be used to heat greenhouses. In this way the company can save a lot on the use of natural gas. In total, three wells will be drilled to a depth of 2 kilometers. One of the wells is used to pump up the water at about 70 degrees Celsius. That water heats the greenhouses. When it has cooled down to about 20 degrees, the water goes back to the reservoir via the other two wells to be warmed up again. Hoogweg has invested twenty million euros in the project. Gloriavale, a community in Haupiri on the West Coast of the South Island in New Zealand, has given $20,000 towards a study into harnessing geothermal activity on the Alpine Fault. Scientists drilled a borehole nearly 900 metres deep along the Alpine Fault near Whataroa, on the West Coast, and found water temperatures of 120 degrees Celsius. The community, which sits near the Alpine Fault at Haupiri, was interested in the geothermal activity as a business opportunity. It is understood the community has already bought a drill to access hot water deep underground. GNS Science is now seeking funding to come up with ways of using the water. Thursday, May 18, 2017 - New Zealand: Discovery "a wonderful scientific finding that could be commercially very significant for New Zealand"
Download the GRC Bulletin - Geothermal News! The GRC Bulletin - from the Geothermal Resources Council - Download your copy today! 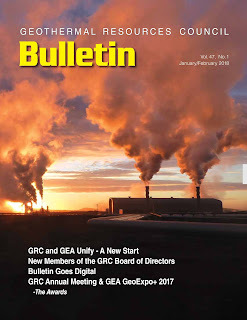 After 45 years of printed publication the voice of the Geothermal Resources Council - the GRC Bulletin - has transitioned to the newest technology. As of the January/February 2018 issue, the magazine is only available as a PDF file online. In the future the new digital GRC Bulletin will only be available online - for members only - on the GRC Geothermal Library website. However, the GRC is allowing access to the first all digital issue for free! Click on the link below. Navigate through the issue by clicking on an extensive array of links. All the ads link to the advertisers' websites - please pay them a visit! Please note, this is a GRC Member benefit. In the future the GRC Bulletin will only be available to GRC Members only. Join the GRC today to make sure you get your copy of the GRC Bulletin. 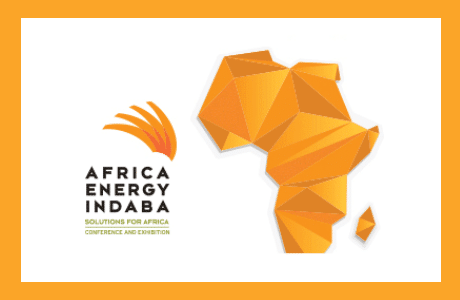 African nations need to diversify energy supply, particularly countries reliant on hydropower, industry experts said at an energy conference in Johannesburg on Wednesday. "You need a mix that allows you to mitigate those types of issues," said George Njenga, GE Power's regional executive for sub-Saharan Africa. The U.S. Department of Energy (DOE) has announced up to $11.5 million in new funding to deploy energy infrastructure on tribal lands. This funding through the DOE Office of Indian Energy Policy and Programs will support Native American and Alaska Native communities interested in harnessing their vast undeveloped energy resources. This Funding Opportunity Announcement (FOA) builds on efforts to strengthen tribal energy, economic infrastructure resource development, and electrification on tribal lands. This is also the first time that DOE’s Office of Indian Energy is issuing a FOA on an entirely fuel and technology neutral basis. 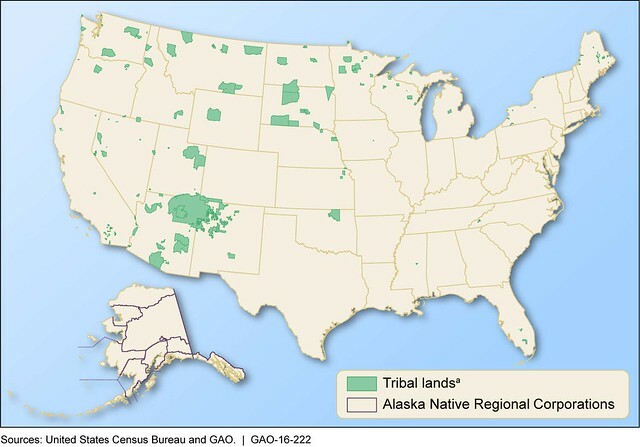 This will expand the potential for tribes to use the particular resources available to them, and is consistent not only with an all-of-the above energy policy, but also with the principles of tribal sovereignty and self-determination. The full FOA is available Here. An informational webinar will be held February 27, 2018, to provide potential applicants with more information. To learn more about the programs and projects within the Office of Indian Energy visit Here. European Lawmakers took a step towards new EU electricity market rules on Wednesday (21 February), during a vote on two draft reports by EPP MEP Krišjānis Kariņš that form the tail-end of the European Commission’s 2016 Clean Energy Package. The Strategic Energy Technologies Information System (SETIS) of the European Commission has approved two new Implementation Plans including an "Initiative for Global Leadership in Deep Geothermal Energy." Demonstrate the technical and economic feasibility of responding to commands from a grid operator, at any time, to increase or decrease output ramp up and down from 60% - 110% of nominal power. The Triassic layer, located at a depth of 4 kilometers, turned out not to be suitable for cost-effective heat recovery. At the end of next week, Trias Westland will carry out the Lower Cretaceous reservoir production test. The exact temperature in this layer will then be known and the project team will develop a plan to connect as many greenhouse enterprises as possible to geothermal heat from the Lower Cretaceous. 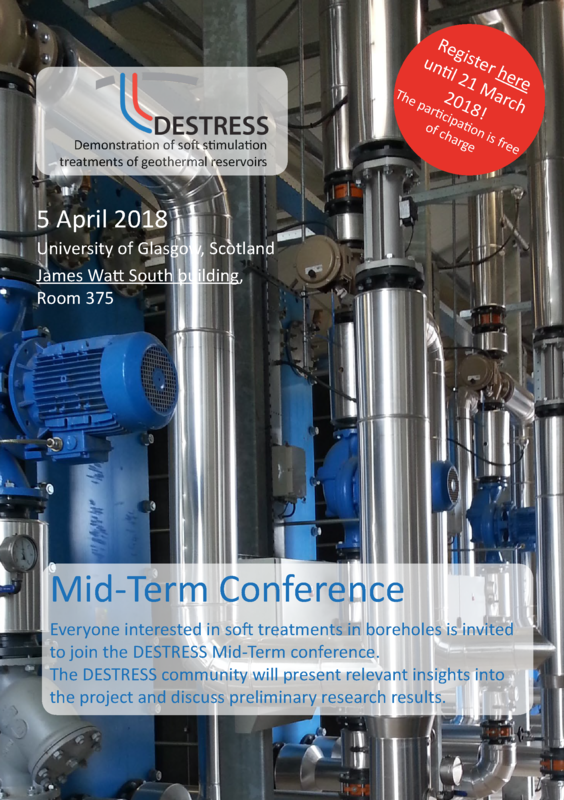 Everyone interested in soft treatments in boreholes is invited to join the DESTRESS - Demonstration of soft stimulation treatments of geothermal reservoirs - Mid-Term conference. The DESTRESS community will present relevant insights into the project and discuss preliminary research results. DESTRESS stands for a promising and future-oriented approach to demonstrate soft stimulation methods of EGS. We focus on solutions for the exploitation of underground heat which are economical, sustainable and environmentally responsible. 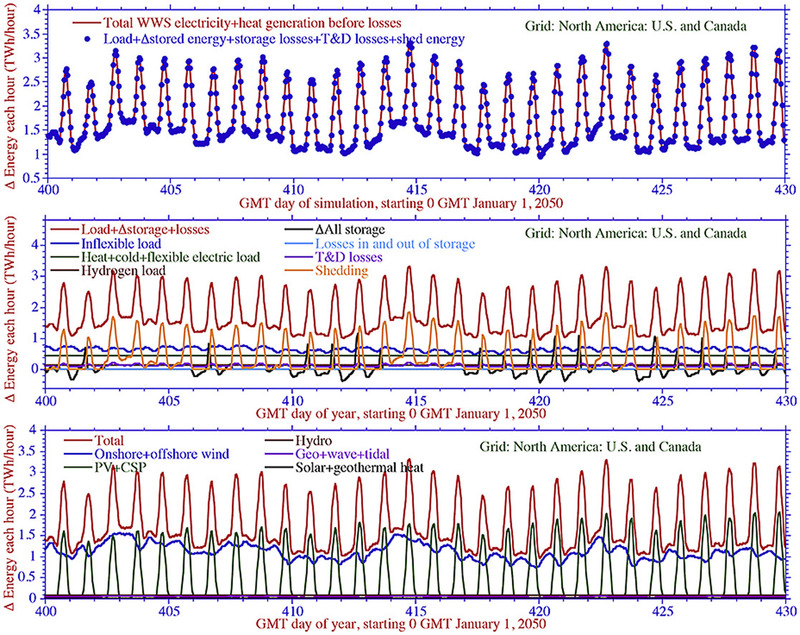 Heat power is an energy baseload – it is not an intermittent energy source. It runs 24/7 regardless of weather, day or night. Heat power, together with solar, wind, hydro, tidal and storage can provide the whole world with clean, renewable energy. Heat power can be utilized at temperatures from 70 degrees Celsius. Minister Eric Wiebes van Economische Zaken en Klimaat (EZK) wil de Mijnbouwwet aanpassen om de winning van aardwarmte te stroomlijnen. (From Google translation) Minister Eric Wiebes of Economic Affairs and Climate (EZK) wants to adjust the Mining Act to streamline the extraction of geothermal energy. State-run Kenya Electricity Generating Company (KenGen) plans to add 1,745 MW of electricity from geothermal sources by 2025, part of a government push to end power generation from fossil fuels. “You are aware that going forward, the government policy which all generators including KenGen and including independent power producers, is to eliminate generation from fossil fuels,” Moses Wekesa, Business Development Director, said during a visit to KenGen’s geothermal plants last week. Geothermal Engineering Ltd (GEL) has launched a Tender for the provision of a geothermal electricity generating plant capable of producing up to 3.15 MW of net power at the United Downs Deep Geothermal Power project located near Redruth in Cornwall. The project is co-financed by the European Regional Development Fund and will be the first geothermal power project in the UK. The site is located at the United Downs Industrial estate, near Redruth in Cornwall. The closing date for the Tender is the 6th of April 2018. Japan's geothermal resources are abundant. Only two other countries -- the U.S. and Indonesia -- have more. The country is sitting on 23.47 million kW of geothermal-sourced current but is only using about 530,000kW. The government, which intends to triple geothermal power generation to around 1.5 million kW from current levels, intends to do more. The Ministry of Economy, Trade and Industry will revise its relevant guidelines during fiscal 2018 to allow geothermal power developers to simultaneously move ahead with their written and actual environmental impact assessments. METI hopes this will result in halving the amount of time these assessments need to two years. The ministry will also double the number of spots where it conducts environmental and resource surveys, then publicize promising geothermal power candidate locations. These measures together with new boring technology could allow geothermal plants to be brought online in a decade, down from 14 years. The Mita Geothermal project is a renewable energy asset that has a 50 year license to build and operate a 50 megawatt geothermal plant. According to Mr. Robins, in the next month or so, they are going to start a very steady flow of news from their drilling and they will be making a production decision within 12 months from now. According to Mr. Robins "We're lucky we inherited a project that has a 50 year license to build and operate a 50 megawatt geothermal plant. They have not done enough drilling to demonstrate 50 megawatts of capacity yet. But the belief is that with further exploration, that's a distinct possibility. " Power consumers are set for better times following KenGen’s announcement that the 158-megawatt Olkaria V geothermal power plant will be operational next year as scheduled. 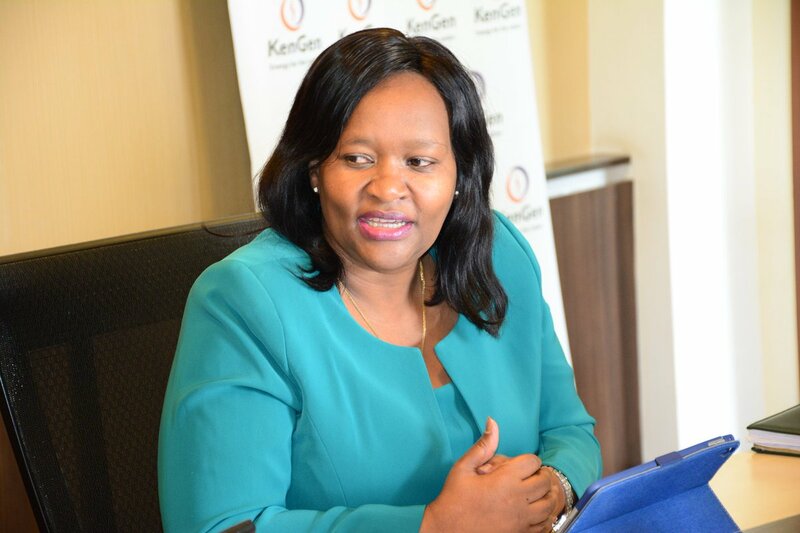 KenGen Managing Director and Chief Executive Officer, Mrs Rebecca Miano says the power plant whose construction began in January 2017 and several other green energy projects at different stages of procurement will ensure Kenyans benefit directly from reliable, clean and affordable electricity. Happy Chinese New Year to the Global Geothermal Energy Community! Happy Chinese New Year (新年快乐) to our members and partners! 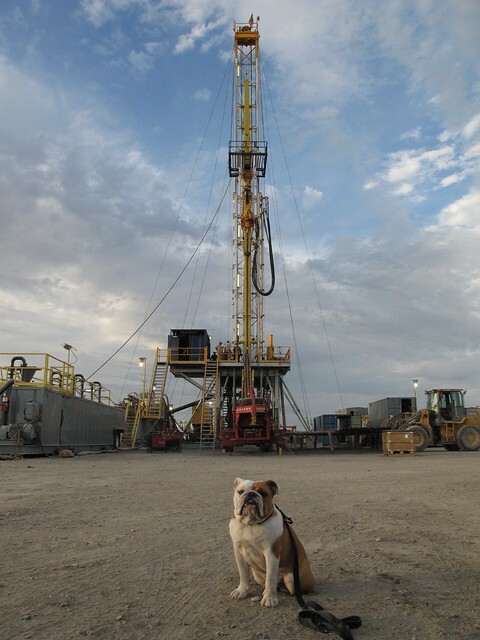 We’re starting out the Year of The Dog by wishing you wealth and prosperity as we spend 2018 working with the global community to expand geothermal energy around the world. On February 16, 2018 the California Department of Conservation, Division of Oil, Gas, and Geothermal Resources (DOGGR) publicly released pre-rulemaking draft regulations (Discussion Draft) for the purpose of receiving public input on the development of updates to Statewide Geothermal Regulations. This public comment period is part of an informal, pre-rulemaking process to develop regulations, and all interested parties are encouraged to participate. Public comment can be submitted through March 30, 2018, by 5pm.